1. Keep it simple - This is NOT the time to bust out your best china or family heirlooms. You should expect that everything on a kids table will be touched and moved and touched some more. Here is a test: Would you be devastated if something were destroyed for ever? If so, it isn't for the kids table. Are you cool with lots of little finger prints all over? Go for it! For this table I used melamine plates that are shatter resistant and dishwasher safe. Two big plusses in my book! 2. Keep it washable - My nieces and my daughter's friends are on the young side of the spectrum, so this may apply less with older kids, but as for right now we have a lot of spills in our life. Beyond just making sure that the plates are washable, I set the kids up with a table and chairs that are all washable as well. These adorable little chiavari chairs are actually made from resin so they wipe down really easily with soap and water, and for tougher stains there is nothing to date I haven't been able to get off of them with a magic eraser. These tables wipe down easily as well and are the cheapest things I own so I'm not worried if they get destroyed. Frosting schmeared on the table? No problem. Rogue crayon drawing on the chair? I got this. 3. Keep it fun! 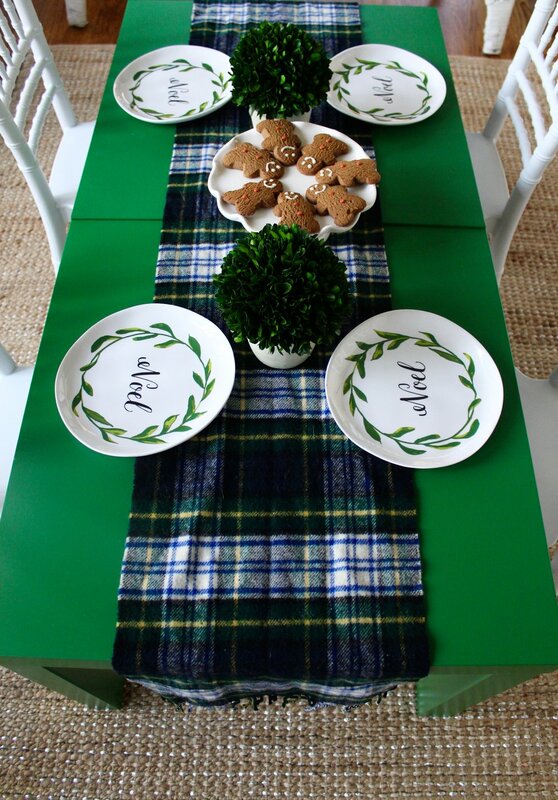 - I love adding fun little touches to kids tables like gingerbread people as the centerpiece. Why not give them a little treat to look at and to nibble on. There is no need to be stuffy or serious when it comes to kids tables. I also love decorating with items made by my daughter. She made an adorable little gingerbread house that works so well in this space. It isn't "pinterest perfect" but it shouldn't be because it was made by a 2 year old. Sometimes fun and sentimental elements are the best! I'm sure my rule list will grow as my daughter does, but for now those are my best tips. Below is a full spread of the space. Now if you'll excuse me I have some gingerbread to devour. Just because I've technically grown-up doesn't mean all of my tastes have!